When I asked my friend and primary recipe tester, Marlene Newell, who runs the site cookskorner.com, to contribute a post during bread month, a challah recipe was the first bread that came to mind, and I’m delighted it did, because I love the soft, egg-rich crumb and flavor, probably my favorite of the non-lean doughs. This is Marlene’s favorite recipe and it comes from one of the foremost bread teachers and writers about bread in the country, Peter Reinhart. If you don’t know about him, you should! See Peter’s blog, as well as his other site and soon to be show, Pizza Quest. “This is my best challah to date,” Peter wrote to us in an email, “and I don’t think I can top it.”—M.R. The Jewish Sabbath and holiday bread got its name in South Germany in the Middle Ages, where it was adapted by the Jewish people as its Sabbath bread. Surrounded by folklore and tradition, the bread is typically braided, with the number of braids representing different virtues. For example, 3 braids symbolize truth, peace and justice. I love to bake bread. I find it soothing and am at peace when I do it. It’s even better to make it on a snowy morning like this one, kneading and rolling and watching the snowflakes drift down. I am not Jewish, but Challah is one of my favorites. Not only is the dough extremely versatile (it can be made into loaves, braided, and makes wonderful dinner rolls as well as outstanding French toast the next day), but it is a fairly simple dough to make and if you braid it, it looks spectacular and is sure to impress your family and friends at the table. The bread is egg rich and wonderfully soft, with a crisp outer crust. If you think you are braid challenged, shape it into loaves or dinner rolls, but honestly, braiding isn’t hard to master (I’ve included pix at the bottom of this post). Start with three strands. You can get into more strands as you gain confidence. Begin in the middle and cross the left strand over the middle, then the right over the middle. Continue this pattern till you reach the end, then pinch then ends together and fold underneath. Then simply turn the loaf around and repeat the process. It can be braided right on the pan you intend to bake it on. I am a fan of Peter Reinhart’s bread books, and this recipe comes from his Artisan Breads Every Day. It’s a two day process (the overnight rest in the fridge gives it great flavor), but if you want Challah the same day, he also has a recipe in Bread Baker’s Apprentice that only takes a day. Recipe – Makes 2 large loaves or 4 small ones. Variations: If you want to use whole eggs instead of yolks in the dough, reduce the water by 2 tablespoons (1 oz/28.5 g) per egg. The yolks are the key to the attractive color and also make a major contribution to the soft texture because they add fat and lecithin, which tenderize the bread. The whites add protein; while that’s a good thing, they also dry out the bread. Also, feel free to add another tablespoon or so of honey or sugar if you prefer a sweeter bread. Reprinted with permission from Peter Reinhart’s Artisan Breads Every Day: Fast and Easy Recipes for World-Class Breads by Peter Reinhart, copyright © 2009. Published by Ten Speed Press, a division of Random House, Inc. I absolutely love Challah. Incredibly versatile bread as you make quite evident in this photo. Can’t wait to make this version. 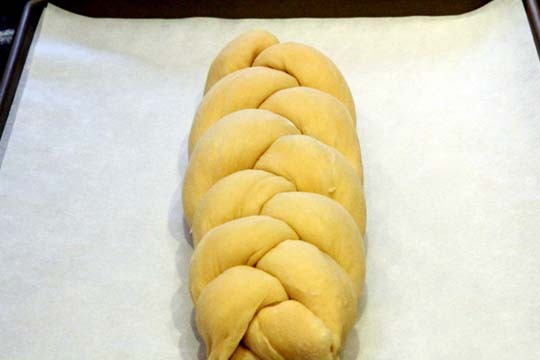 When we made challah for the first time we made a 6 braided version and used this YouTube vid to teach my wife and I how to do it. 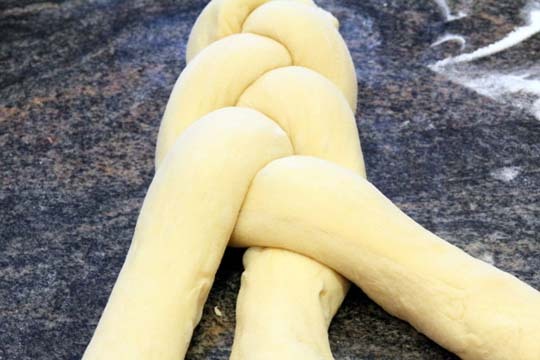 That was the same video I used to learn the six strand braid for the challah I baked. I also found her technique for adding the seed to the top perfect, too. You would never know that it had been the first time I’d ever baked Challah. I used the recipe from The Silver Palate cookbook, which in retrospect, is more like a brioche than a challah. It was quite rich. I love Peter Reinhart, I got 3 of his breadbooks and always refer to them each time I make bread. I definitely make challah for the weekend. Thanks for sharing. I love the challah recipe in the Cooks Illustrated “Baking Illustrated” book. Goes together like a dream in the Kitchenaid and doubles easily if you want two huge loaves – I made four in a day for Christmas. Wonderful! I wanted to make challah this weekend. I also have a couple of Peter Reinhart’s books. You’ll probably want to knead by hand for 8-10ish minutes… but check it a little earlier. When your dough has been kneaded enough it will pass the windowpane test, and it’s internal temperature will register about 80*F on an instant read thermometer. 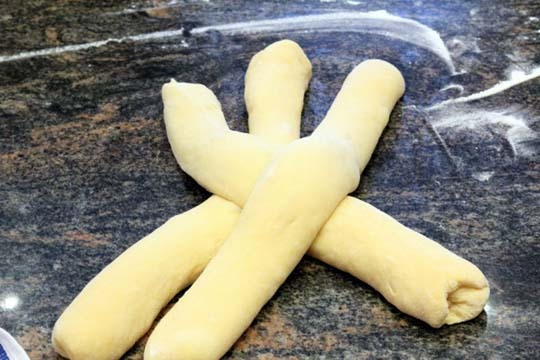 Most bread doughs follow these rules. lulu, according to the recipe, not any different. You can mix by hand with a wet wooden spoon for 4 minutes, then turn out and knead for another 2. This is a very sticky dough till it comes together, hence the wooden spoon. Artisan relies more on the cold fermentation technique so there is usually less kneading in most of the recipes throughout the book. This was one of my favorite breads from Bread Baker’s Apprentice! Shall have to revisit it sometime soon, if I can ever get over my addiction to anadama bread. Challah has always intimidated me. I think it is the fact I am the only boy scout who failed the macrame merit badge that has created a life long fear of braiding things. As someone who makes Challah on a weekly basis, I always braid 6 strands. Its a lot prettier then the standard 3 and really easy once you get the hang of it. If someone is interested I can post a how- to. I am so excited to try this! I love Challah bread! Leah, I would love to know to do the six strand. Challah is the only bread I’ve made that consistently turns out well. Thanks! I’m not sure why I’ve never attempted to make Challah; I love everything about it. I think that’s going to change very shortly. I’m hosting a group of local food bloggers on Saturday morning and all of a sudden I’ve found the perfect recipe I didn’t know I was looking for! Ok, I’ll try to put together something in the next two weeks. Check out Comment #2, Walker Lawrence provided a Youtube video that shows how to do the 6-strand braid. It’s quite good. Ok, so! I was startled and delighted* this morning to find that the unassuming double handful of dough put in the fridge last night had hit the 5qt mark on my container – holy cow, so much dough! It’s taking the two-hour rest on my counter now, and loaves are imminent. This is exciting! *Not to be a size queen or anything. No joke about the size! I just took mine out of the fridge, and it, too, was at the top of my 5 qt bowl! It’s in the final rise now… very excited! I ain’t no Challah back girl!! 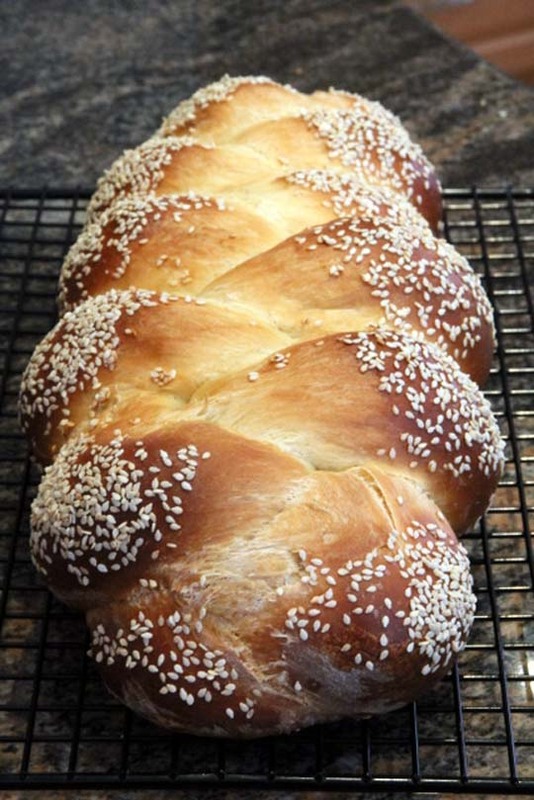 Beautiful challah, when I make some, I always try to make an extra loaf or two. It makes the best stuffing, and the best french toast. Both are highly recommended if you have any left over. Her site has handy step-by-step photos. Mine turned out beautifully. I suspect these loaves won’t last long in our house! Beautiful Bread thanks for the recipe. As always copied down and in the to bake list for this weekend activities permitting. I like to have homemade challah for Shabbat dinner, but don’t always have time to make it fresh. Can I freeze a loaf after braiding, then deforst and bake? Any advice? you should be able to do this–try it and see! I usually make challah the night before, mix dough, let rise about 4 hours, braid, and then put in the fridge overnight, take it out and hour or two before baking, then bake. Any thoughts on whether this technique would work well with the given recipe. 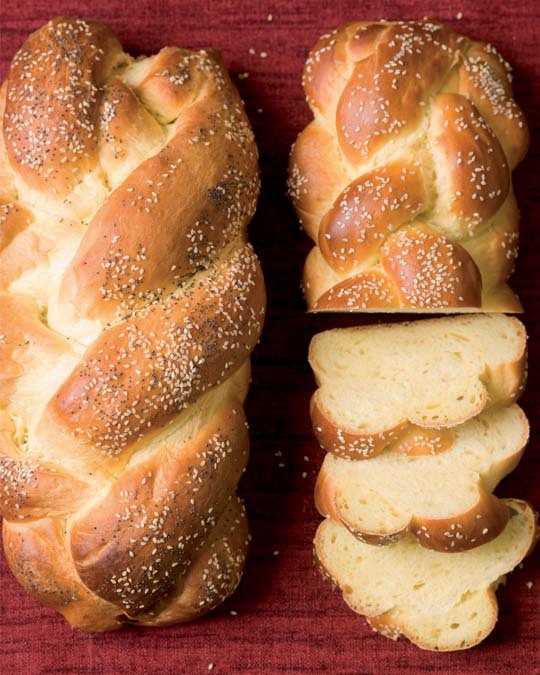 I tend to make a leaning challah but look forward to trying this recipe, but the timing I mentioned works much better for my schedule in terms of getting challah on the Friday night table. this sounds like a good strategy. What, if anything, is challah traditionally served with (butter, preserves, etc. )?